The new Behringer X32 has been making waves in the digital mixer market. 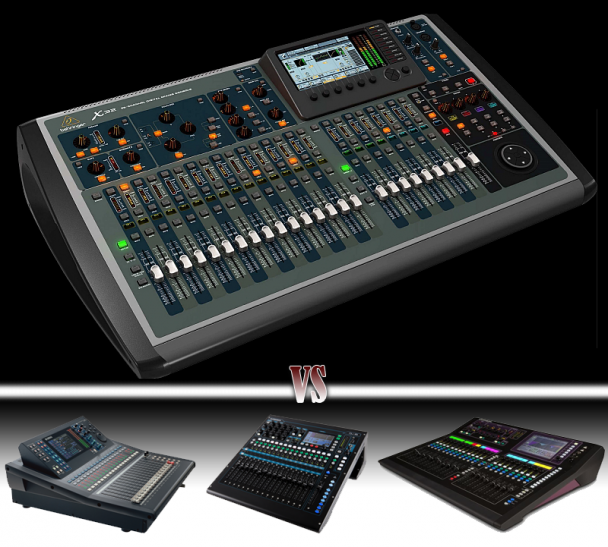 Can it really compete with higher priced mid range industry digital mixers? There has been a lot of talk about the Behringer X32 being as good as or better than the Allen & Heath GLD, QU16 and the Yamaha LS9. Do I believe this? Well, there are plenty of Internet forum posts where users attest to the excellent sound quality as it uses microphone pre-amps designed by KLARK TEKNIK. As a provider of industry standard PA hire solutions, the name Behringer is a swear word. It has been synonymous with low quality sound and unreliability. Therefore, it would take a lot for Datarhyme to use this brand. Sound quality is just one of many important factors when choosing a PA product. There is reliability, hire-ability and familiarity. Reliability is a given. Hire-ability is another given if there’s a requirement to generate additionally funds by hiring out the mixer. Who will be comfortable hiring a Behringer? Finally there is familiarity; will contracted sound engineers be familiar with the Behringer? Infact, will they be happy to using the Behringer? Clearly there are many hurdles for Behringer to over come to change opinions in the professional market. At less than half the price of an Yamaha LS9-32, there is plenty of potential in the personal arena for local performers and bands who provide there own PA equipment. This is probably where this product will excel. The pre-amps are designed by Midas and not Klark. My bad, yes the Pre-Amps were designed by MIDAS but KLARK TEKNIK did contribute to the design of this console. Hi… if we talk about the sound quality, can u make a ‘side by side’ comparison between X32 and LS9?